The new MK-6 Mo'Phatt Keys is a sleek keyboard version of E-mu's Mo'Phatt sound module and MP-7 Command Station desktop module. The MK-6 comes with the Mo-Phatt's 32 MB "Pure Phatt" soundset and it is full of brand new and classic Hip Hop type sounds, from basses and synths to drum kits, scratches, vinyl effects and more! Additional E-mu expansion ROM soundsets can be added up to 128 MB. The keyboard is a full 61-keys long with 16 real-time controllers. There's also 16 on-board syncable/programmable arpeggiators and the Mo'Phatt's Super BEATS interactive Groove Mode. With 16 mute/enable buttons this keyboard is set for live and on the fly performances with plenty of real-time controls! Like the Mo'Phatt, the MK-6 has 64 voices. The MK-6 also features multi-mode resonant filters, 24-bit DACs, and an affordable price tag! The MK-6 is part of a new line of performance keyboards launched by E-mu that repackage their current line-up of top notch sound modules targeted at specific genres. 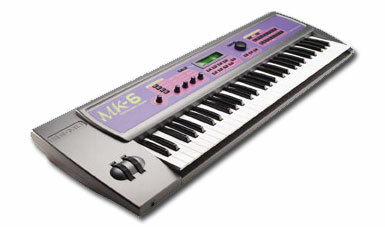 For all purpose synthesizer, the PK-6 Proteus Keys. For HipHop and R&B, the MK-6 Mo'Phatt Keys. For techno trance and dance, the XK-6 Xtreme Keys. And Halo from Ensoniq, which is another all purpose synthesizer.